I’m going one better on Meat Free Mondays, by following up with Tofu Tuesdays. 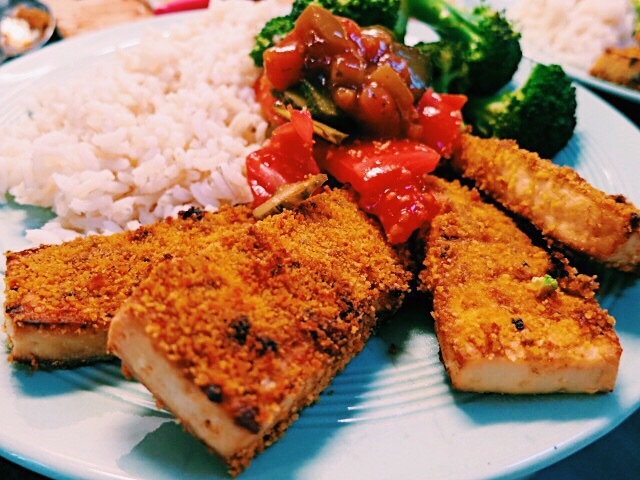 Tofu Tuesdays is to encourage at least one vegan meal a week. As tofu is so versatile each week is gives rise to a totally different flavour. You can make a huge array of tasty dinners with this one staple item. 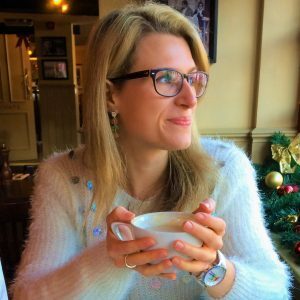 The brand I use is available in most supermarkets, it’s vegan, organic and supplied by Cauldron. For this week’s Tofu Tuesday I was craving something hearty. That’s how my peri-peri coated tofu recipe came to be. Crispy wedges of tofu, marinated in a rich peri-peri inspired sauce, breaded & grilled to crispy perfection. Served with wholemeal rice and stir-fried garlic broccoli. A healthy week day meal that packs a load of flavour. I had some left over salsa which made a welcome addition also. One thing to remember though is that tofu tastes better if you give it time to marinate. 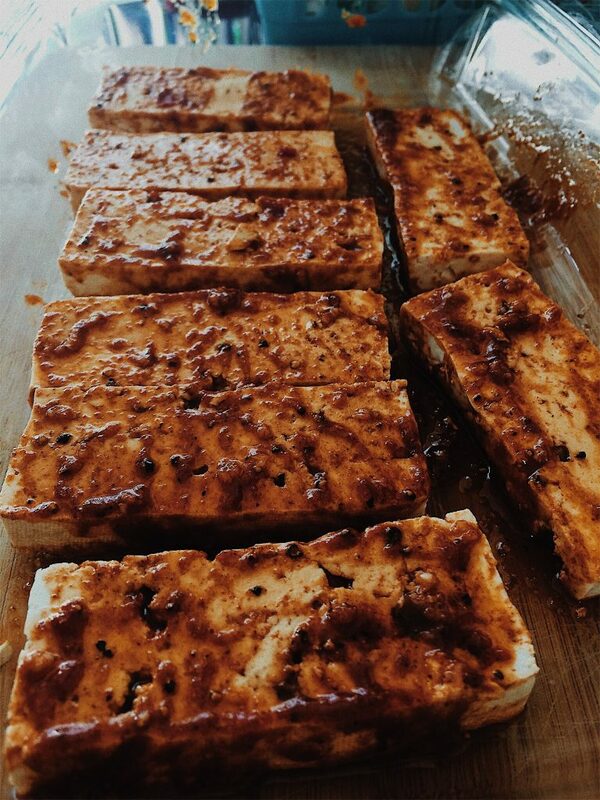 Ideally, you want to be preparing your tofu the night before to really let the flavours sink in. Not only this but I squeeze the tofu dry before I even think about the marinade. This is a highly techical process that involved finding heavy kitchen objects! If you are a tofu sceptic then this is the dish for you. It’s taken me a few attempts to make tofu flavoursome enough. If you’re willing to do the prep work and wait overnight, it’s so worth it. My willing partner who, as my taste tester, has had a number of tofu dinners, has even crowned this the best yet. What made it even better was that the evening sun was blasting. Eating al-fresco is one of my favourite things about the summer. Lovely! If only every Tofu Tuesday had such nice weather. PS: A slightly naughtier alternative to grilling is shallow frying the tofu. A vegan dinner, loaded with peri-peri goodness. Prepare the tofu. Wrap it in kitchen roll and press for at least 10 minutes to remove some of the water. 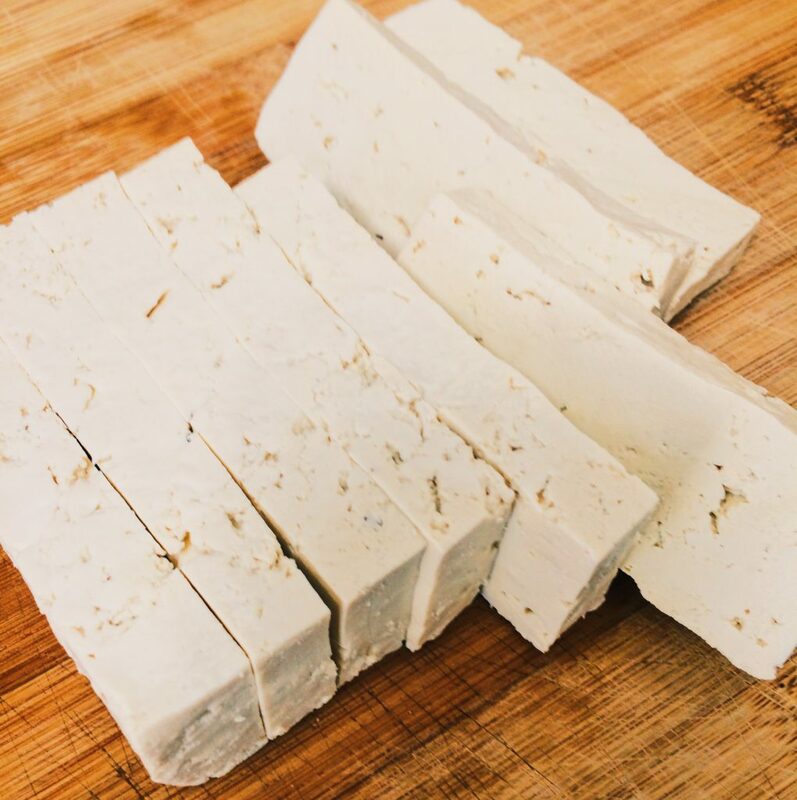 Once this is complete, cut the tofu into rectangular wedges and repeat the pressing process. Prepare the marinade. In a bowl combine the olive oil, bbq sauce, worcestershire sauce, tomato puree, lemon juice, minced garlic, onion powder, mustard, smoked paprika, chili, salt & pepper. Mix the ingredients well until fully combined. If the mixture is too thick you can add more puree. In a flat dish lay out the tofu. 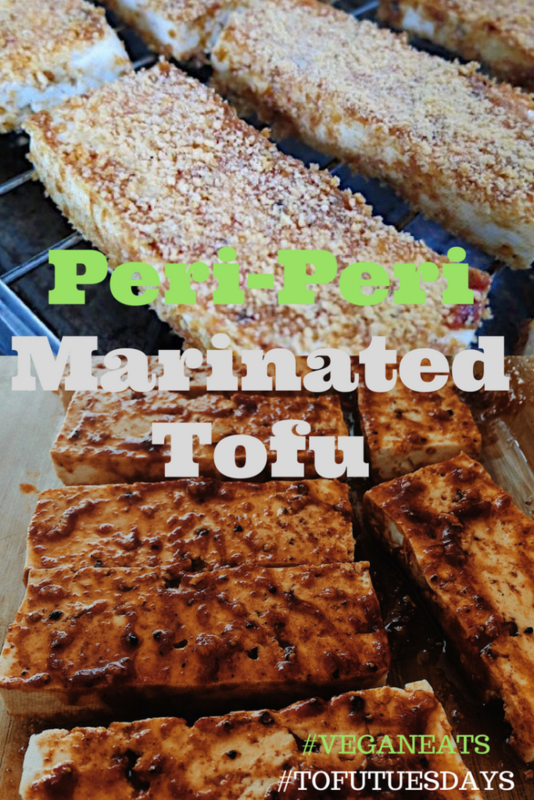 Cover in the marinade, ensuring you turn each piece of tofu so it is covered on both sides. Cover the dish with clingfilm and put into the refrigerator. Ideally, ths tofu should marinate overnight for full flavour. Retrieve the tofu from the fridge and uncover. 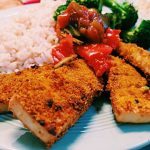 Using a spoon, sprinkle over breadcrumbs on each slice of the tofu. Turn and repeat on the other side so that each wedge is full coated. 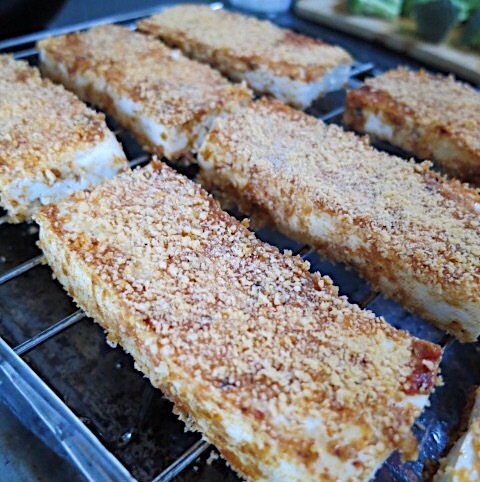 To cook, arrange the tofu on a grill and heat for 8-10 minutes either side. I like the tofu to be crispy as possible, so for the final minute or two I move the grill rack higher to finish it off. Serve the wedges with wholemeal rice and a side of salsa. For a bit of greenery, add stir fried broccoli with garlic.